Therianthropes are composite human and animals figures. Only a very few have been found, there are five noted in the literature, and they are very famous and widely reported. All of them have been found in deep hidden recesses. Two examples have been found in the Cave of the Three Brothers. Of these one has a human body with a bison head, tail and hooves. Another composite from the same cave has a human body with what appears to be an owls face and antlers. 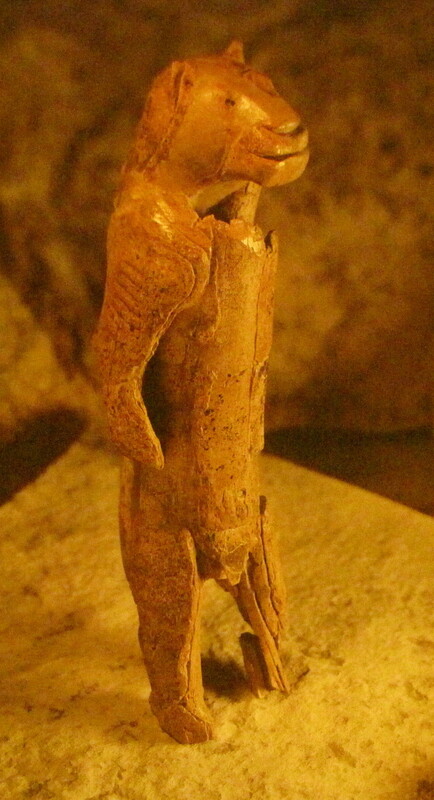 Another very similar creature with a bison head and tail is found in the Cave of Gabillou. 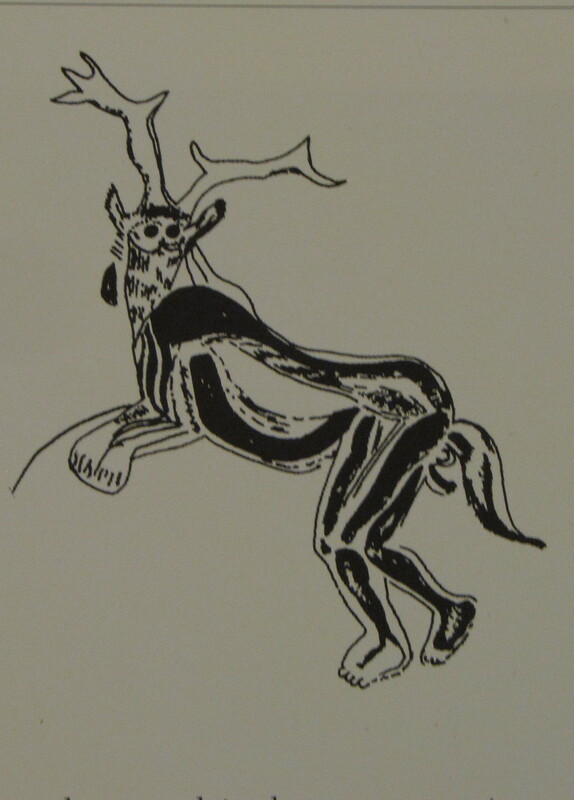 This one and the bison headed therianthropes from the Cave of the Three Brothers are both in similar postures with one leg raised in what is assumed to be a dance posture. They both have horned animal heads on human bodies with their sexual organs prominent. Finally a fourth example is found in the shaft at Lascaux. This one has a human body with a bird head. These mysterious envoys have been regarded as masked shamans or divine creatures, as animal masters, as totems, as ancestral personifications of some force of nature, and as representatives of the archetypal energy of the ancestors that reaches back before humans were separated from the animals. The fact that there are multiple images, albeit only a very few, signify its importance as a motif. There is also the ivory statue of the Lionman who is another example, in a different medium, of a therianthropic design. Figures of a part human, part animal appear on cave walls with various theriomorphic amalgamations. These images have been taken to be masked shamans or mythic anthropomorphic creatures like a centaur. These fantastic composite naked creatures, while very rare, are a reappearing motif, a stereotype sometimes horned, sometimes bird headed, sometimes dancing, often ithyphallic. These grotesque, enigmatically symbolic creatures have deep roots in prehistory as hybrids of wild nature who were the divine rulers of the wilderness who survived as Pan, Faunus, Ganiklis, Myrddin, Mad Sweeny and Silvanus. They were wildmen of the forests who, in later times, accepted sacrifices to protect the people and provide prophecies to warn them. These phallic gods were fertility daimones who bring forth new life in the animal world as over lords of orgiastic festivals marking rebirth in nature. These therioanthropic powers are at the chiasma that links the human with the spectrum of nature. At these deep roots symbols spontaneously manifest in an organic physiological process. This salvific contact taps a power continuous with the whole of nature. The birth of art is a conduit to the transpersonal connection, stimulating and infusing the human mind with the autogenous ectatic experience of the natural, primeval, oneric, unconscious, instinctive experience of nature. They appear to be receptacles of powers unknown to our world, technicians of the sacred in an atemporal beyond at the cosmic threshold of the world of essence. These therianthropic images are the mediating force penetrating the cosmic threshold to the world of essential nature. They can be found only after a dangerous journey into the underworld where the threshold of awareness is opened to revelations. Built by the tools that articulate symbolic capabilities outside normal experience they have an emergent inner order that serves to alter consciousness in a coincidence of opposites, uniting the great symbolic presence of animal/human, inner/outer, below/above, and stillness/movement in a great ecstatic return to origins where the ancestors dwell as prophets of wisdom in a psychoidic realm of instinctual cosmic archetypes in the durative paradigmatic mythic realm.